Prayer is our most direct connection with God. As in any conversation, occasionally it’s important to stop talking and listen to see if God has anything to say to us! Sometimes we pray silently. Sometimes we pray out loud. Either way God is listening! What’s more, God understands your everyday language. Speak to God as you would to your most trusted friend. 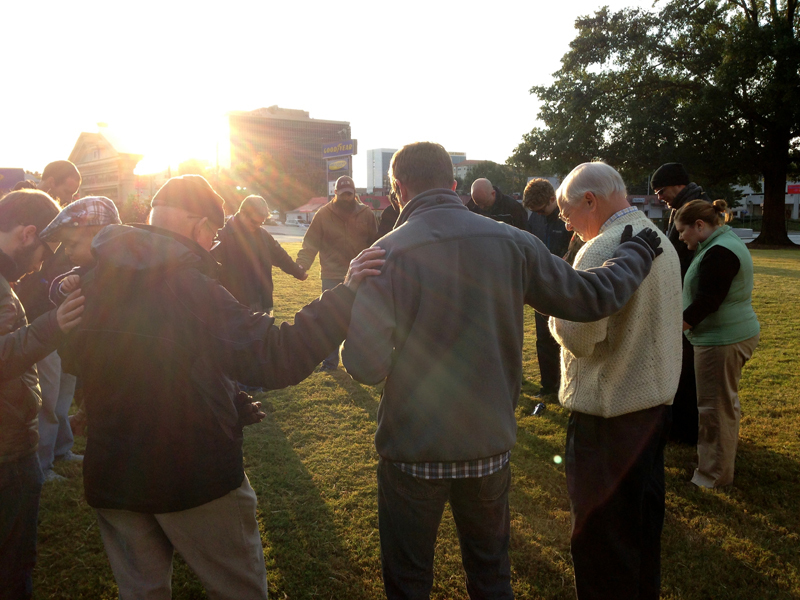 We publish a prayer list each week with the names of people who’ve asked for prayer. If you give permission, we’ll add your request to that list. If your request is for someone else, please ask that person if it’s okay to put him or her on the list. If your prayer isn’t for a wider group to know about, the pastoral staff will be honored to go to God on your behalf. Would you like to make a request for prayer for yourself or others? This is a private request, for pastors only. This request may be publicized to the congregation. A contemplative prayer group meets every third Monday to practice various kinds of Christian contemplative prayer together and to sit in silence in God's presence. The location varies, so if you are interested, please contact Mark Parnell at markparnell@att.net. "Gentle One who walked this earth, why is it that our needs embarrass us so? Why do we try so hard to be self-sufficient, as if being by ourselves, untouched, unnurtured by another is our goal? We seem threatened by our need. Our interdependence frightens us. And we pretend, with the emperor, that we are richly clad. The tailors knew the truth though they kept silent. The children knew and as children will, they shout the truth lest rocks themselves call forth. If truth be told, then all are free! The locks are sprung, the doors flung open. All that waits is that we stand and walk (like "Stand and walk. Be healed!" of years gone by) and find that sharing common sun and sky is fine dependence. Unlike the emperor, we're chilled without the royal disguise and find we must take shelter with each other where much to our surprise our needs and we are held." From More Than Words, by Janet Shaffran, DCP and Pat Kozak, CSJ. Published by Meyer-Stone Books. May we remember that our God is the God of bringing restoration to the weary and brokenhearted, but that we, too, are called to participate in its creation. Praying for justice and peace for our nation. Pray for peace in communities throughout our nation. Pray for the families, loved ones and communities of victims of gun violence. Pray for law enforcement officers and first responders. Pray for discernment and good judgement, and for safety. Pray for peaceful demonstrations in cities and towns all across our nation. Pray for all affected by violence and terror in our nation, whatever the source. Pray that you can be an instrument of God's justice, peace, hope and love. Praying for peace in our world. Pray for all areas impacted by violence, terror and war. Pray for all humanity impacted by violence, terror and war. Pray that you can be an influence for justice and peace in the world. Praying for the victims of hurricanes, tornadoes, floods, earthquakes and fires. Pray for the families of those lost in natural disasters. Pray for those who have had their homes and neighborhoods damaged or destroyed. Pray for all those who are responding where needed. Pray about what you can do to help others in these disasters.